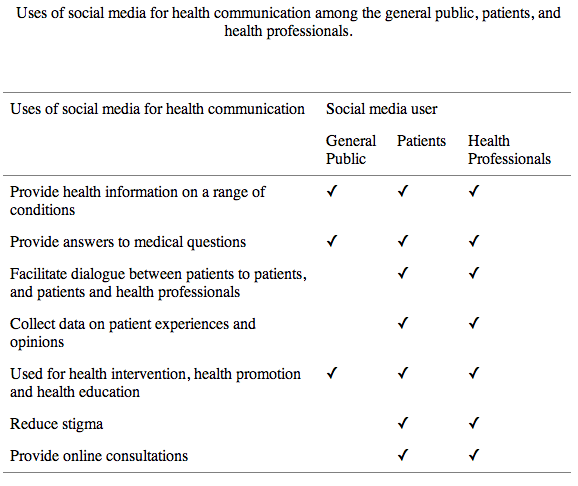 Based on 98 original research studies the authors have set out to review published literature on social media for health communication in order to identify the uses, benefits, and limitations of social media for health communication among the general public, patients, and health professionals. Secondly, they aim to identify current gaps in the literature and provide recommendations for future health communication research. The paper gives a comprehensive overview of the topic and the reference section is a great resource list. If you’re not up for reading the paper in its entirety, three of the tables gives a great summary of the findings. Follow the link to the paper above or check out the tables at the end of this post. 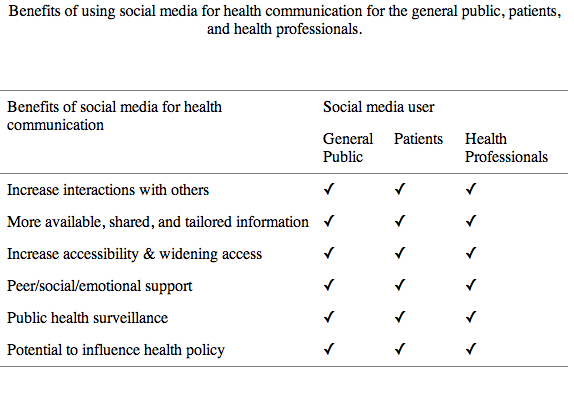 One thing that strikes me is that if you take a look at table 3, which lists the different uses of social media for health communication, the use of social media for communicating science and research in health is not on it. Neither when it comes to research communication between health professionals nor communicating health related research to the public is mentioned. An interesting and slightly surprising find I would say. Granted, it could to some extend figure under the categories ‘Providing health information’, ‘Proving answers to medical questions’ and ‘Facilitate dialogue between patients and health professionals’, but none the less it is not a category in it self. Whether this is because it has not be the focus of any research studies, or doesn’t take place at all is hard to tell. I believe (and hope) however, that it is the later. 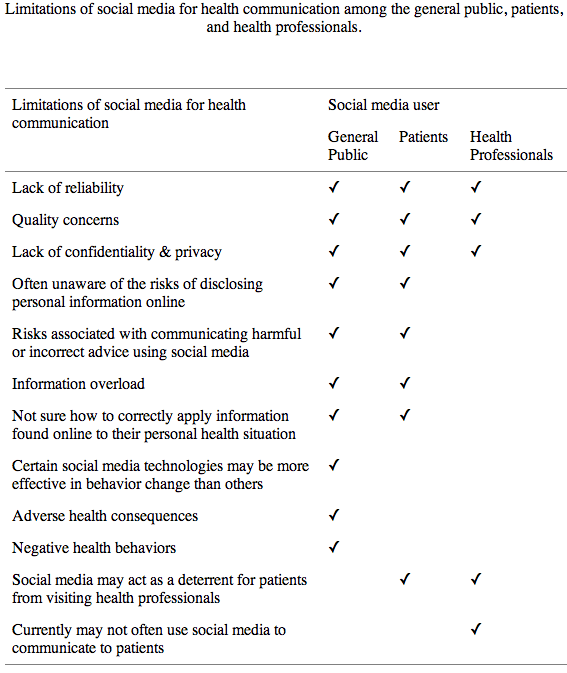 None the less, the article underscores the growing role and importance of social media in health and in health communication, and shows that it cannot and should not be ignored.